Sandstorm's Blog (Home of ssUltimate Library): Combobox using RowSourceType = 3, How to update content? Combobox using RowSourceType = 3, How to update content? Well I use this to answer inside foxite forum earlier but then I just thought maybe some does not know yet how to use a cursor from an SQL SELECT as RowSource of a combobox, or if some do, they are maybe wondering how to update such when there is a change from the source table/cursor, in result keeping them away over its usage on a combobox; so I transferred it over here as part of my simple tutorials. You see, I prefer to work on cursors on my end as that makes my app works faster, less prone to corruption (possibility of corruption may happen only during transferring of data from cursor to actual table), and easier to maintain. So I use cursors on grids, listbox, combobox, etc. 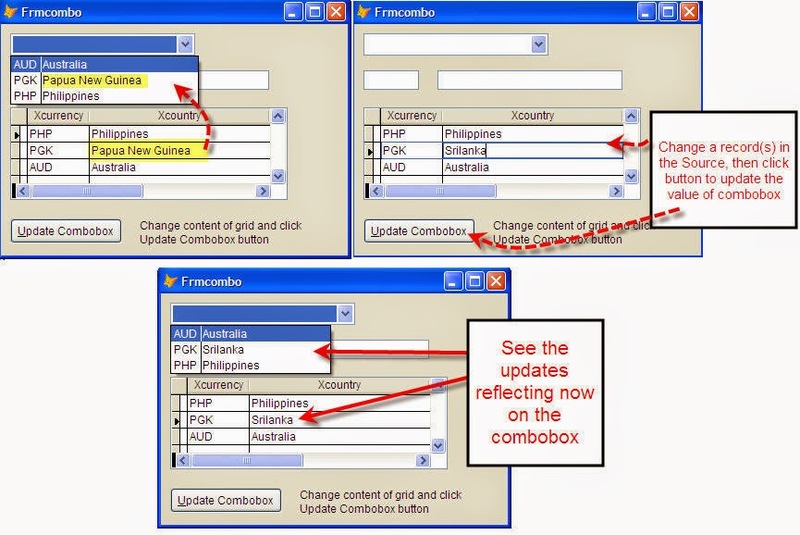 However, some may have been wondering that if they use a cursor for a combobox RowSource, how to update said combobox then when there is a change in data from the actual table it is coming from? Or in other words, how to show the changes back to the combobox when it is already set to run on a cursor that was created earlier than when the change on the actual source table/cursor happened? And there you are! Cheers!